Not Fade Away 1980: Atmosphere, by Joy Division. The problem I have with the Joy Division story is the ending. A man alone in a house. He watches a movie, listens to a record, writes a note to his daughter, throws a rope over the clothes rack in the kitchen, puts a noose around his neck and kicks away. As conclusions go that’s definitive. It’s also rigid, implacable, a violent full stop. And the stain of that one singular event seeps back into every song, every word, every photograph, every aspect of the story. Retrospectively all of it now leads to that ending. What else is there? Incomprehension, mostly. Read Peter Hook’s biography and it’s clear he still can’t square the laddish behaviour of the band’s daily round and the central mystery of why his friend Ian Curtis should take his own life. Despite all we know about Curtis’s epilepsy – which had progressed to grand mal seizures of increasing frequency – about his failing marriage and his relationship with another woman (and about his previous attempts at suicide), there’s still no understanding of what went through his head that night in May 1980. How can there be? How can we ever know what another person is thinking or feeling? Ian Curtis’s death brutally stopped Joy Division’s forward motion just as an American tour and their next single, Love Will Tear Us Apart were looming. More than that, it encased the band in marble. Their music became instantly funereal; suddenly, horribly, it was haunted. Fans, journalists, the rest of the band began to search for hidden messages in the lyrics. 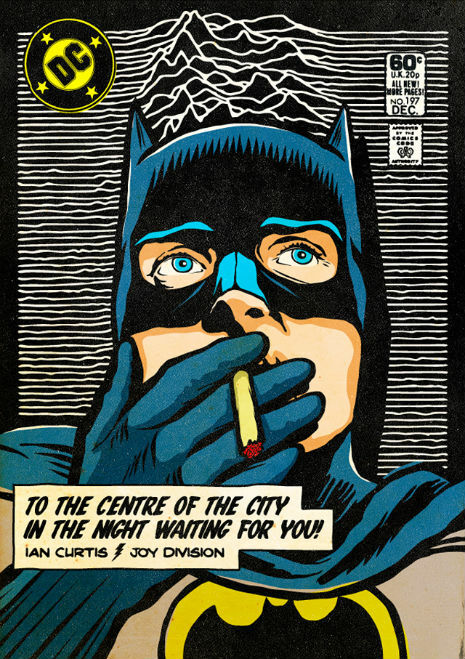 Curtis’s death became the prism through which to see Joy Division, to talk about Joy Division, to listen to Joy Division. There’s now no space in their music to fit yourself within. Curtis’s absence is too much of a presence for that. And that’s why I didn’t want to pick Atmosphere for 1980. Because, released after Curtis’s death in the UK, it became a requiem march. If anything that romantic myth is all the more burnished now, three decades later. So it’s difficult – impossible, I guess – to listen to Atmosphere as I did when I first heard it, before I really knew much of anything about the band or their story. When to my ears the watery depth of the percussion, the worming bass line and the synthetic orchestral shiver that colours it gives the song this huge autumnal feel that spoke to my own teenage melancholy. The Cure’s A Forest – another contender for this year – does something similar with its horror movie chords and wispy synths, and it doesn’t have to carry the weight that Atmosphere does. Because heard now, the lyrics, and Curtis’s rich, deep ache of a vocal inevitably play to the myth – “Don’t walk away in silence”. The whole thing has – and there is no way around it – a doomy elegance. But I still want to embrace Atmosphere, almost in spite of myself. Because it is beautiful. And because it embodies and reinvents where rock music had been and points ahead to where it might go in the new decade. This is an uncomfortable choice, not just because of the range of options but because I don’t want to endorse the myth. Pop music started out as a celebration. Too often it has become a commiseration. That’s not an ending devoutly to be wished. Not even by the rest of band. The end of Joy Division, the end of the story, is painful. But that only makes the sequel all the more wonderful. I love this song, I always have. But I love the music that New Order, the band the survivors of Joy Division would become, more. Because in the end they chose life. The tragedy is that for whatever reason Ian Curtis couldn’t bring himself to do the same. via Not Fade Away 1980: Atmosphere, by Joy Division | Herald Scotland. The bside was “Another Journey by Train”. Average at best. But, controversially, I’d take a Forest over Atmosphere. Now, if it was She’s Lost Control I’d be in trouble trying to decide.